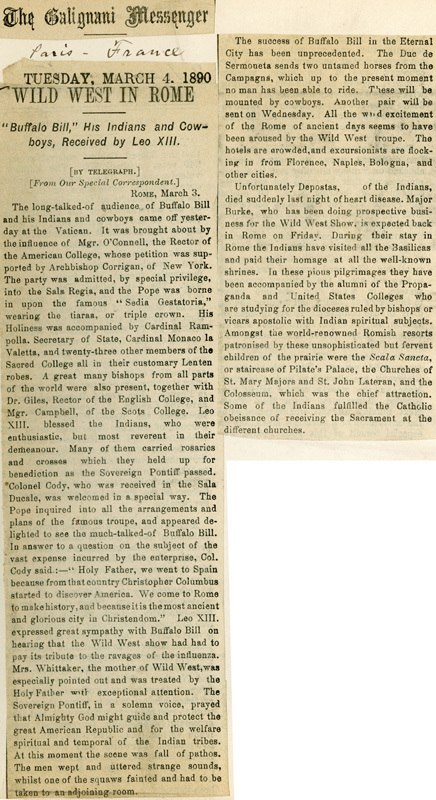 "Buffalo Bill," His Indians and Cowboys, Received by Leo XIII. The long-talked-of audience of Buffalo Bill and his Indians and cowboys came off yesterday at the Vatican. It was brought about by the influence of Mgr. O'Connell, the Rector of the American College, whose petition was supported by Archbishop Corrigan, of New York. The party was admitted, by special privilege, into the Sala Regia, and the Pope was borne in upon the famous "Sedia Gestatoria," wearing the tiaraa, or triple crown. His Holiness was accompanied by Cardinal Rampolla, Secretary of State, Cardinal Monaco la Valetta, and twenty-three other members of the Sacred College all in their customary Lenten robes. A great many bishops from all parts of the world were also present, together with Dr. Giles, Rector of the English College, and Mgr. Campbell, of the Scots College. Leo XIII. blessed the Indians, who were enthusiastic, but most reverent in their demeanour. Many of them carried rosaries and crosses which they held up for benediction as the Sovereign Pontiff passed. Colonel Cody, who was received in the Sala Ducale, was welcomed in a special way. The Pope inquired into all the arrangements and plans of the famous troupe, and appeared delighted to see the much-talked-of Buffalo Bill. In answer to a question on the subject of the vast expense incurred by the enterprise, Col. Cody said:—"Holy Father, we went to Spain because from that country Christopher Columbus started to discover America. We come to Rome to make history, and because it is the most ancient and glorious city in Christendom." Leo XIII. expressed great sympathy with Buffalo Bill on hearing that the Wild West show had had to pay its tribute to the ravages of the influenza. Mrs. Whittaker, the mother of Wild West, was especially pointed out and was treated by the Holy Father with exceptional attention. The Sovereign Pontiff, in a solemn voice, prayed that Almighty God might guide and protect the great American Republic and for the welfare spiritual and temporal of the Indian tribes. At this moment the scene was fall of pathos. The men wept and uttered strange sounds, whilst one of the squaws fainted and had to be taken to an adjoining room. The success of Buffalo Bill in the Eternal City has been unprecedented. The Duc de Sermoneta sends two untamed horses from the Campagna, which up to the present moment no man has been able to ride. These will be mounted by cowboys. Another pair will be sent on Wednesday. All the wild excitement of the Rome of ancient days seems to have been aroused by the Wild West troupe. The hotels are crowded, and excursionists are flocking in from Florence, Naples, Bologna, and other cities. Unfortunately Depostas, of the Indians, died suddenly last night of heart disease. Major Burke, who has been doing prospective business for the Wild West Show, is expected back in Rome on Friday. During their stay in Rome the Indians have visited all the Basilicas and paid their homage at all the well-known shrines. In these pious pilgrimages they have been accompanied by the alumni of the Propaganda and United States Colleges who are studying for the dioceses ruled by bishops or vicars apostolic with Indian spiritual subjects. Amongst the world-renowned Romish resorts patronised by these unsophisticated but fervent children of the prairie were the Scala Sancta, or staircase of Pilate's Palace, the Churches of St. Mary Majors and St. John Lateran, and the Colosseum, which was the chief attraction. Some of the Indians fulfilled the Catholic obeisance of receiving the Sacrament at the different churches.